Decided to make a background again, cause I hate myself. 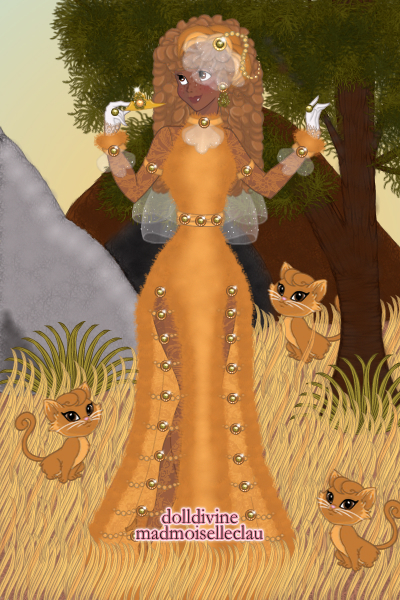 >_> The dress & background is inspired by the main Zodiac of August - Leo (the Lion). The green jewels are of the birthstone, Peridot. & the white ruffles are a shout out to the Zodiac Virgo, who makes a small appearance in August. Today is the last day to vote for Kalea to move on to the next round of competition, please vote for her with your crowns to see her next week! O^O oh my gosh...this is so adorable! I love this so much! This just makes me want to watch Lion King again it is phenomenal! I adore the split skirt and the background is of course wonderful! This is absolutely STUNNING cosmic 8D . I wish that i had your skills. You make all that great work look so effortless and gorgeous. I love the shade of the dress, the jewelry and the background. It's magnificent work. Good luck in the contest and let's hope that you win ;) . Awww the lil lion cubs are just too cute!! And she looks great as a mother lioness. The background looks like a wonderful home for them. Faved!